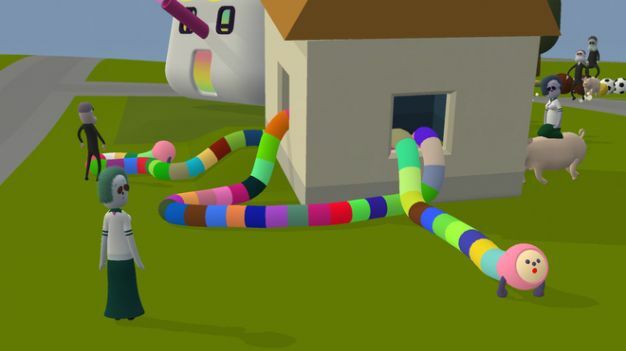 The creators of the charmingly addictive Katamari Damacy are hoping you’ll get hooked on their upcoming game, Noby Noby Boy. The PlayStation 3 downloadable title, scheduled for release sometime in early 2009, will have you playing as a rainbow-colored creature who can stretch his monstrous body to terrifying lengths, devouring and discarding any and all objects in his path. Tell me I’m not the only one who feels like Keita Takahashi has mined the delusional nightmares of a paranoid schizophrantic for this latest creation, the most misfortunate of all of god’s creatures. Katamari Damacy rolled into our hearts with its unique gameplay mechanic, quirky visuals and bubbly music. Noby Noby Boy, on the other hand, will mash our bones into paste to spread on his morning toast, which is actually just a huge pile of skin and hair! Hit the jump for an exclusive look at some unedited, uncensored gameplay footage. Now, some of you may say, “Wait a minute, this is a clip of that freaky Freddy snake from Nightmare On Elm Street 3: Dream Warriors!” But hold up a photo of Freddy snake next to a photo of Noby Noby Boy, look me in the eyes, and tell me they’re not the exact same picture. Other than one having a thing for rainbows, I honestly can’t tell the difference.